Cinnamon may be the equivalent of love. Think about it, when a room smells of warm cinnamon, you feel cozy and content. How about feeling good and guilt free as well. 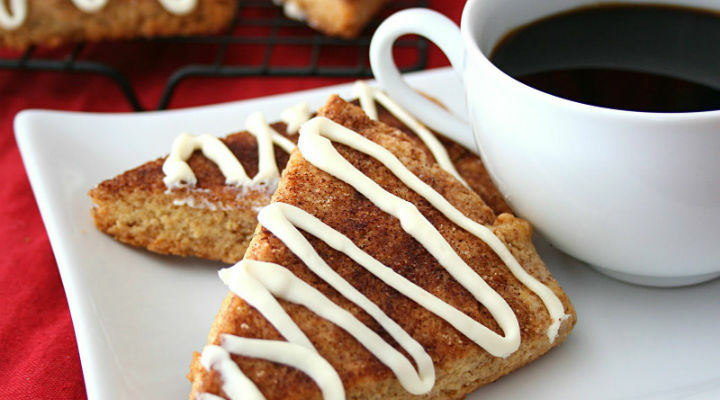 Enjoy this low carb and gluten free cinnamon rolls scones. Step 1: For the scones, line a baking sheet with parchment paper and preheat oven to 325F. Step 2: Whisk together almond flour, erythritol, baking powder, baking soda, salt and cinnamon in a large bowl. Add in egg, coconut oil, cream, vanilla extract and stevia extract until dough comes together. Step 3: In a small bowl, whisk together filling ingredients. Sprinkle half of filling into dough and mix in, but do not fully incorporate, so that it remains streaky. Step 4: Turn out dough onto parchment-lined baking sheet and shape by hand into a rough circle, 7 or 8 inches in diameter. Sprinkle with remaining topping. Slice into 8 even wedges and separate carefully, then space evenly around the baking sheet. Step 5: Bake 20 to 25 minutes, or until scones are firm and lightly browned. Keep an eye on the bottoms to make sure they don’t burn. Step 6: Remove from oven, transfer to a wire rack and let cool. For the icing, beat cream cheese, butter and cream together until smooth. Beat in powdered erythritol, vanilla and stevia extracts until combined. Pipe or spread over cooled scones.